After 5 days of forced rest, I am feeling mostly normal. Which really just made my day because I've been a bit bummed thinking I wasn't going to be able to run today for Sherry. After Ward's 20 miler, I got changed into my running gear, grabbed Pepper and her leash and headed out for a little run. Pepper and I did 2 miles today. I wanted to go further but thought it would be best to play it safely. I do not want a relapse. It was a quiet run, thinking about Sherry and the her family and friend's terrible loss. Thank you, Suar, for putting together this amazing run for your cousin. My heart goes out to you and your family. I'm glad you were able to get out there and run! Mike and I did too! 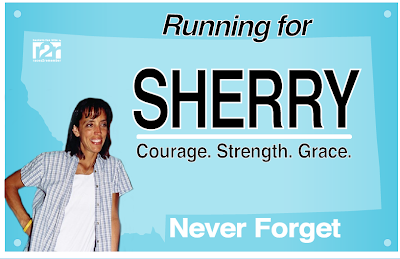 Glad you got to run for Sherry today and are off of forced run.